Two Great Awards, One New Blog Series, And A Partridge In A… Well, You Know. Courtney Reese and Jemi Fraser, two of my writing-heros-slash-comrades, have each given me a new blog award! Hooray! 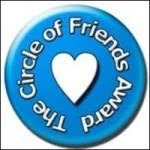 The first is from Jemi and is called the Circle of Friends award. I’ll agree with her: The online writing community has got to be the best in the world! Well, maybe with the exception of the online poodle grooming community. And possibly the online cross-stitching community. But seriously, after those two? DEFINITELY the online writing community. As far as I can tell, there are no requirements for receiving this award, so I’ll just pass it along to my usual five very worthy bloggers who are core elements in my online circle of writing friends! 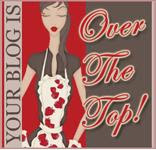 The second award is from Courtney and is called the “Over the Top” Award. I don’t know exactly what that means, but I’m pumped that I got it! Rules for accepting this award: Answer the following questions with Single Word answers then pass this along to 5 other bloggers. What Room Are You In? Classroom. Where Were You Last Night? Home. Something That You Aren’t? Petite. Where Did You Grow Up? Alabammy. Last Thing You Did? Laughed. What Are You Wearing? Clothes. Something You Aren’t Wearing? Socks. Last Time You Cried? Monday. One Place You Go To Over And Over Again? Happy. Favourite Place To Eat? Home. Okay. PART TWO OF BLOG POST. In the near future, I will begin a new series here on the blog entitled “Pre-Famous Author Interviews.” This means I’ll post interviews with writers I know from Twitter, Facebook, blogs, or *gasp* real life. It’s a chance for them to spread the word about themselves and their current WIPs, and it’s also an opportunity for everyone to meet them. Sort of. Because people, y’all are cool. Folks need to know about you. And you’re “Pre-famous” because one day you’ll just be “famous” and we can all say we knew you when. I’ve already got several of you lined up for these interviews, but if you would like to be a part of one, please let me know! I am thrilled to do this and I hope you will be, too! OK – that’s all for today. Love you. Mwah. Bye. Congrats on your awards! You deserve them (obviously). Can't wait for the interviews. It's going to be great to read about everyone. Great idea! Courtney: Thank YOU my dear! And I can't wait to do the interviews. I'm excited to get to know people better! Shannon: Thanks! You have a great weekend too! Congrats & great choices for the pass-alongs! Oh, I love this idea!! What a great way to bring writers together, Anne! Also, congrats on your awards. You're most deserving, luv! And thank you for passing this one on to me. I love this one! And I love that you consider me as part of your circle of friends. Love love love it! Eisley: You are so welcome, hon! You deserve it! Jemi: Ha! I know. Bizarre, isn't it? Who knew these people were real?? Carol: I heart you! And I'm glad you are excited about the new series. I can't wait to start it! Shannon: Oh my gosh are you kidding? TONS of people would want to read an interview with you! In fact, I think I'll tweet you right now and send you the questions! Thank you soooooo much Anne!! Squeee! And I would totally do an interview, I'm not even going to be coy about it:-) That's an awesome idea! Hooray! Thanks Frankie! I'll be in touch very soon about the questions! I love the idea of pre-famous interviews. How fun! Thanks Megan! Yeah, it should be a good time… first one is going up tomorrow-ish! Your Dream Last Night? Ick. What Room Are You In? Apartment. Where Do You See Yourself In Six Years? America. Something That You Aren't? Easy. Where Did You Grow Up? Alabama. Last Thing You Did? Snoozed. What Are You Wearing? Towel. Something You Aren't Wearing? Shoes. When Was The Last Time You Laughed? Yesterday. Last Time You Cried? hmmm…. One Place You Go To Over And Over Again? Bed.